Ansel Adams’s Mural-size Photographs Are “Statements of Importance and Beauty” | Skinner Inc. 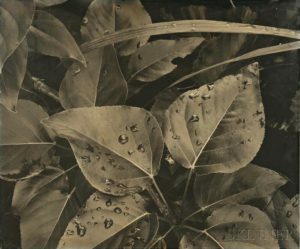 Among the highlights of Skinner’s May 19th Fine Photographs auction are two mural-sized gelatin silver prints by noted photographer Ansel Adams. Adams was a founding member, along with Imogen Cunningham, Edward Weston, and others, of Group f/64, a San Francisco Bay Area-based alliance of eleven American photographers that formed in 1932. Taking the natural environment as their primary subject, the group’s photographs celebrate both organic form and personal expression. The name Group f/64 references the smallest camera lens aperture, which yields the sharpest depth of field to accentuate texture and form. Dedicated to the belief that photography should emphasize its unique capabilities rather than emulating other artistic mediums, the members of Group f/64 used large-format view cameras to produce sharply-detailed, high contrast photographs and made contact prints rather than cropping or enlarging their negatives. The first mural-sized work on offer is an unmounted later print of one of Adams’s most iconic images, Frozen Lake and Cliffs, Sierra Nevada, Sequoia National Park, California (Lot 137, $10,000-15,000) made in 1932. Adams used a long-focus lens to isolate the scene and composed the image to exclude the sky, creating a two-dimensional flat abstraction of nature that reflected a new way of seeing for landscape photography. While best-known for his majestic views of the American West, Adams was also drawn to details of the natural world. 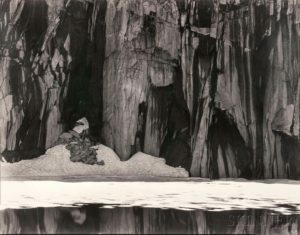 In contrast to Frozen Lake and Cliffs, Leaves and Raindrops, Glacier Bay National Monument (Lot 142, $15,000-25,000) shows interaction with nature on a direct and human scale and demonstrates Adams’s interest in seeking out subjects that emphasized “design, pattern, and sheer beauty of tonal relationships.”[ii] The print, which is mounted on ¾ inch plywood and varnished, was a gift of the artist to Martha Stiles on the occasion of her marriage to noted Harvard Business School professor Paul Lawrence in 1948 and is being sold to benefit the Cambridge Community Foundation to which is was bequeathed in 2015. Come see all Skinner’s photography offerings at previews on May 17th from 12PM-5PM, May 18th from 12PM-8PM, and May 19th from 9AM-10AM. The Fine Prints & Photographs auction opens for bidding on May 19th at 12PM in our Boston Gallery. [i] Ansel Adams, “Photo-Murals,” U.S. Camera I, no. 12 (November 1940): 72. This entry was posted in Blog and tagged Ansel Adams, art, boston, f/64, fine art, fine photographs, photographs, Photography, skinner, skinner auctions by Michelle Lamunière. Bookmark the permalink.